Debbie from Squiggly Twigs Designs gives some practical advice for teaching children to sew, along with the process that she has used to teach her own children. Her method focuses on encouraging confidence, but at the same time maintaining safety and helping the child learn the vocabulary and process of sewing. 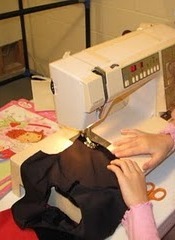 If you have a child who wants to learn to sew like you, then give her tutorial a read. Go to the tutorial.